Ever since its debut on ABC in the fall of 1990, Steven Bochco’s Cop Rock—a series blending the gritty police drama that Bochco brought to the airwaves on Hill Street Blues with the singing and dancing of a Broadway musical—has been pop-culture shorthand for a misguided flop of the highest order. Even with this reputation, however, Cop Rock has developed a devout cult following, one that has regularly demanded to know why the series has yet to receive any sort of home video release. Now Shout! Factory—a company which has made dreams come true for more than a few fans of cult TV—is finally swooping in to save the day. 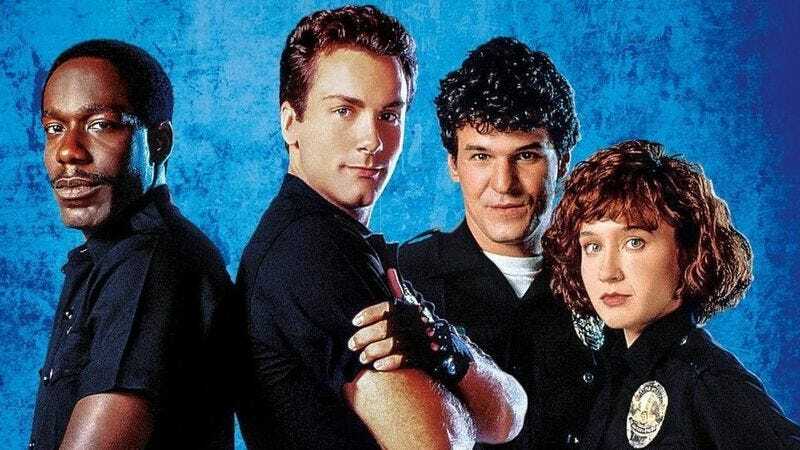 On May 17, Cop Rock: The Complete Series will at long last be available, with a 3-DVD set featuring all 11 episodes and new interviews with Bochco as well as actress Anne Bobby, who played Officer Vicki Quinn on the series. To help tease the set’s impending arrival, Shout! Factory has provided The A.V. Club with an exclusive clip featuring the song “Choose Me, Baby!” Not that you necessarily need the context, but it features Officer Jessica Wolf (Tammy Amerson), one of eight female undercover officers assigned to help round up johns in a neighborhood where they’ve already cleared out all the hookers, demonstrating how she’s going to “advertise” while on assignment. Before we leave you to the clip, we’ll leave you with one last tantalizing tidbit: next week, The A.V. Club will be unveiling “Under the Gun: An Oral History of Cop Rock,” featuring interviews with series creator Steven Bochco, several of the show’s songwriters, more than half a dozen cast members and guest actors, and a future Emmy winner who copped to having unsuccessfully auditioned for the series. Prepare accordingly.